This is an unsolicited review of a shop I found while visiting Charleston, SC. While I was seriously disappointed to find NOT ONE yarn store in Charleston proper, in my search for one, I came across a store called “Beads on Cannon“. It is a bit north of the historic district, but it is right on the free bus route. The day we went out to Middleton Place, I had A drop me off there on the way back into town. It was very easy to find as we came into town from the plantation. Once I walked in the door and was greeted by the proprietress (I think her name is Lisa) I knew I was in bead heaven. All the ads I saw said the selection was huge, the store is BIG. Well, the store isn’t big, but the selection is HUGE! I don’t know how she fit all those beads in, and people, too! There are two rooms, one up, one down. Down is mostly glass beads, up is precious gemstones, findings, etc. I wandered about with my basket for at least an hour before I made my selections. It was almost overwhelming! I didn’t have a particular project in mind, which made it harder to shop, really, but I found a beautiful silver sea star pendant, and then got some beads that might go with it for a necklace. I also picked up some cut glass beads for knitting, and some garnets I just couldn’t resist. Not sure what they will be. Some pearls I got in the hopes that I can figure a way to knit with them. I’ll let you know how that goes. My choices in no way reflect the true scope of the beads she has. I have never seen such an array of good quality beads in one place. Big boxes have more selection (maybe) but her quality is much better than you will find at them. While I was there other shoppers came in and got great assistance as they looked for particular things. 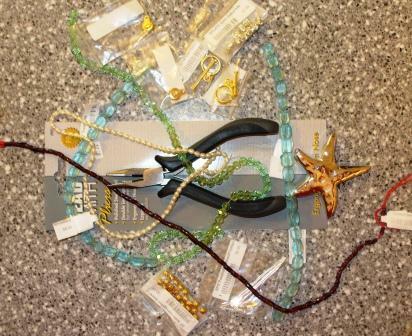 One woman was designing a necklace, and the creative process was fun to watch. They do offer classes, and will even make the things you design if you want them to. It was pretty amazing to see all that they had in the place and all that they would do to help a person. If I ever am in Charleston again, I will go better prepared with a bead list! 40 hours in the car with someone who prefers to drive than ride? I knew I was in for some serious knitting! 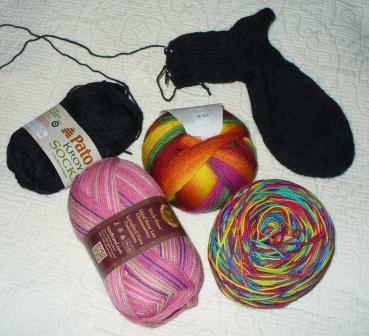 I brought a pair of socks in the works, and yarn for three more pairs. As well as yarn and beads all strung and ready for earrings and necklaces. I plugged away on the dark gray socks, and when we arrived in Charleston after 20 plus hours of driving, this is where I was on sock 2. The night before we left I powered through that last bit of leg, having done barely a row a day up to that point. 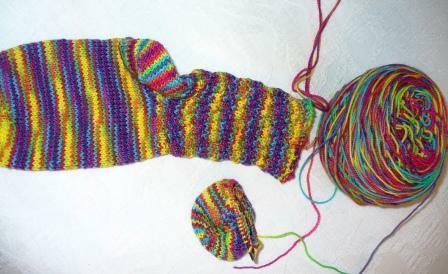 On the way home, I cast on the Dyeabolical bright yarn I got back in March, and then things started really moving. 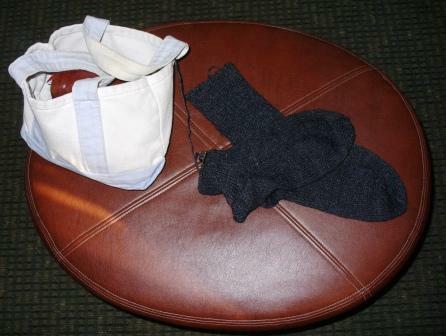 I finished one sock each day of the trip home, so by the time we arrived home again, I had 2 new pairs of socks! So naturally, I sat down and cast on the next pair. Author salpal1Posted on April 28, 2014 April 28, 2014 Categories how it came out, what I am makingTags knit, road trip, socks with Sarah8 Comments on Big plans! A got me this game board for our license plate game, and this road trip was our first time using it. It worked pretty well! If you see the plate, so did we. Day one was Maine to northern Massachusetts. Not too bad for only a couple of hours, off-season! Day two took us down to Roanoke, VA. Long day, and lots more states! On our arrival in Charleston (I forgot to take a photo) we still needed about 8 states. Meanwhile we did see a Bahamian plate in Charleston. Nothing on the map for that one, though. Only a couple of things on this week’s list. Get in the car and DRIVE HOME. Or part way, anyhow! Our plan is to stop for the night in Baltimore. Right near IKEA. I am navigating, after all. 🙂 It makes a good, if expensive, place to stretch our legs after a day in the car. Two ten plus hour days should get us home. Have loved being in Charleston, but it also will feel nice to be at home. Miss those little furry kits. Don’t miss the 40 degrees at home, but what can we do about that except wait? Lots of uneventful (yea!) hours in the car heading south, and we arrived in Charleston Sunday afternoon, after all the heavy rains and flooding left. Easily found our hotel (the King Charles) on Meeting street, and unloaded, stretched, went for a short walk to work the kinks out. Then had a fabulous dinner at Jestine’s Kitchen, right down the street. I have never had fried chicken like this – OMG, it was delicious! A had a pecan crusted chicken, and we had their fabulous cola cake for dessert. Perfect end to a weekend in the car! Yesterday (Monday) we took a bus tour around the city to get oriented and see all the things we should see. It was interesting, and did get us very well oriented. This part of the city is not very big, but has so many nooks and crannies to explore. We went for a walk in the afternoon and explored the upper part of King Street, also went to eh Charleston film at the Visitor center. While there I asked about local yarn stores. Turns out, there are none in the city proper. there is one about 30 miles away. Can you believe it? A city with a population (including suburbs) equal to half the population of my whole state, and there are no yarn stores? Very odd. A said maybe they don’t knit here because it is so warm? I can’t answer it, just am disappointed. There is a huge bead store I will check out on Thursday, though. Today we took the ferry ride over to Fort Sumter and explored that. Not much there, really, just a fort that is being restored, a museum and a gift shop.. but it was nice to be on the water (as we think it is hot) and it was interesting to see the fort and learn more about it’s history, beyond it’s place in history at the start of the Civil War. after lunch, we rested a bit, and I went for a swim. I thought the water was on the cool side, but easily bearable, but a nice southern lady said she knew right away I was from the north, because apparently the water is too cold to get into. Ha! I was cool for the rest of the afternoon. I conned A into taking a short walk with me after that, we walked all the way down East Bay to the Battery, and back up Meeting Street – lots of beautiful things to see, but we were both hot again and tired when we returned. So now we are just resting and cooling off before we have our delicious supper in our room. I think tonight it will be peanut brittle, Krispy Kreme donuts and a little praline. And of course, left over fried Chicken from Jestine’s Healthy diet! Tomorrow we head off to explore Middleton Plantation. Maybe I will find a yarn store over that way. Certainly I will work on the dark gray socks. PS one thing I did do this week is read Sue Monk Kidd’s The Invention of Wings, and I loved it. I would have loved it even if we weren’t here, but nice that it is set in Charleston. We have kept our eyes peeled for the Grimke House, and finally I looked it up. We have walked around it three different ways, but never actually past it. When we have the car out tomorrow, I hope we will remember to drive by so I can snap a photo…. After a week of general stress and overload at work trying to cram everything in and wrap up taxes, it will feel darned good to go on vacation. This is the first time in many, many years we have gone away for more than a weekend. 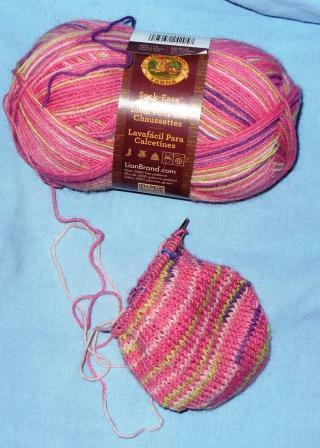 Check out my Ravelry page for info on most recent socks. I’ll post photos eventually, but it might not be until I return. It was so nice to have one of my “normal” three-day weekends! I did MOST of my Friday list, and still found time to relax and do some knitting. Handmade Easter cards did not happen, though. Saturday was a simply gorgeous day! Did a few chores in the morning, then drove over to see CrimsonCrow and help her with her taxes, before heading to Bangor to Husson U to pick up niece B. We got home in time to get her laundry started and make homemade pizza for supper. We played a couple of games and did lots of talking, played with beads (I made another pair of earrings) and I went off to bed around 11, very much later than normal. Much earlier than normal for her, I know. Sunday A and I got up early, A made a lasagna for our trip to Mom’s. We all left here in time to get there for lunch, which was a big pre-Easter potluck. All my sibs and in-laws were there, and three nieces. It was so nice to have almost everyone there, although it would have been nicer if the other three next gens could have been there. There was underlying sadness because Mom had to put her old dog down on Saturday, our sweet Sammy. Little niece E wore her black dog t-shirt so we would have Sam with us in spirit. He had been sick for a while, and at 15, it just didn’t seem like it was fair to take dramatic efforts and treatments to get him through this episode. they could not promise he would stay better, or be able to do the things he loved. he will be missed. E story of the day – apparently a child in class told her there is no Easter bunny, tooth fairy, Santa Claus, etc. So her cousins were asking her about it, and she said “Your Mom or Dad puts on a pink bunny suit with big ears and hides the eggs” my sister and I in the kitchen were hysterical, picturing that, the tooth fairy and Santa costumes they would now need. The downside is that E now thinks everything they tell her is a lie. I know she will adjust, but I still remember finding out about Santa Claus. It was very tough. Leaving on a positive spring note – Mom had flowers on her table FROM HER YARD! Snowdrops and Chionodoxa, with a mini daffodil from in the house. Very pretty and a sure sign that spring will get here eventually. Author salpal1Posted on April 15, 2014 Categories how I spent my day, What I loveTags family, handmade cards, knit, taxes, weekend10 Comments on what a nice weekend!